The majority of the developed, American landscape has been crafted around automotive transport. As auto technology matured, increasing amounts of resources and area have been devoted to expanding and solidifying our road newtork. 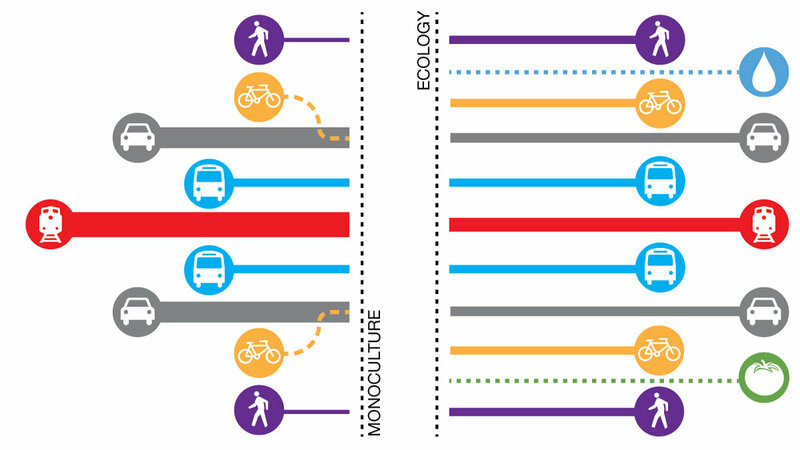 The result has often been environments that are built for a monoculture of cars rather than an ecology of transit. Fort Collins’ South Mason Street has had an additional degree of complexity given its rail access and stands as a thoroughfare with the primary objective of maximizing functionality of cars and trains at the expense of pedestrians. These two forms of transit hold a disproportionate presence in the composition of South Mason Street that make it more of a road for cars than a street for people. Permaculture is the development of complementary, interconnected systems to form a productive ecology --not dissimilar from the goal of a vibrant streetscape. Applying permaculture principles South Mason Street can replace its transit monoculture with the cultivation of a multi-modal ecology. Helping to support the natural environment does not begin with endangered species, but the foundation of ecological health at the smallest of scales. Building up from there helps rebuild ecologies and fortifies them in their entirety. New raised planters can take their form from concrete footings bolstered with recycled content like fly ash and ground glass combined with reclaimed railroad ties. From there the ecologies can grow, starting at soil health fueled with local compost all the way to the myriad of native and migratory birds. this multi-layered ecology provides a number of dividends: solar shading, biophilic environments, rainwatrer absorption, air purification and a continuous production of seasonal fruits and berries. Whether managed by the city or its residents, the communal orchard can help to redefine the modern roles of infrastructure and its engagement with the community. The proposed plan added an estimated 3,300 linear feet of bike lanes, created 4,850 square feet of protected pedestrian walking space, have the capacity to capture 67,350 gallons of stormwater runoff and supplied 100 fruit trees for urban agriculture.